The Governor announces his candidacy via video today, followed by an interview on Good Morning America. On Thursday, he will hold a kick-off rally in Denver, before departing on a two-day tour of Iowa. 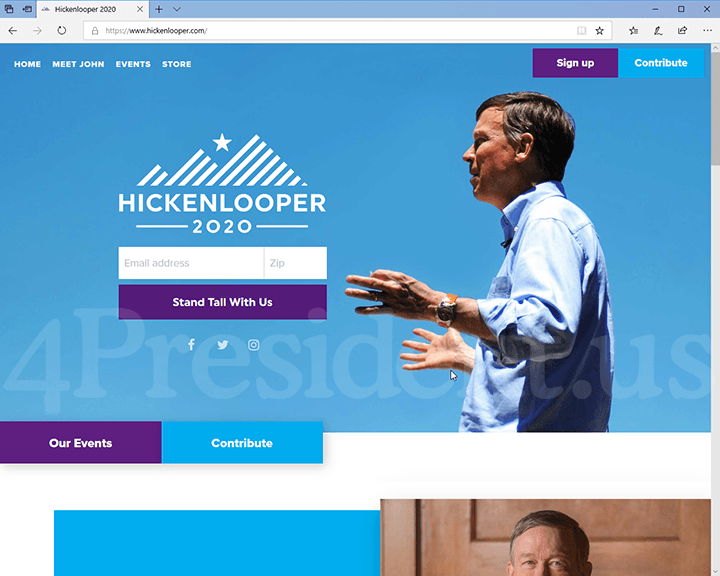 Denver, CO - Today, Former Colorado Governor John Hickenlooper launched his campaign for the Democratic presidential nomination. Hickenlooper announced his decision to run in a campaign video, “Stand Tall” [LINK]. The video highlights the Governor’s sixteen years of executive experience and his record of accomplishment in the face of great adversity. At the start of his first term, he faced a historic recession, devastating droughts, forest fires, and floods, as well as the tragic mass-shooting in Aurora. Under the Governor’s leadership, Colorado confronted those challenges - passing historic gun reform, striking back against climate change, and jumping from 40th in job growth to the number one economy in the country. The Governor has accomplished that 'progressive change' by bringing people who don’t always agree to the table. Colorado now has near universal health insurance coverage, thanks to the Governor’s bipartisan effort to build one of the most robust exchanges in the country. Additionally, as Mayor, Hickenlooper worked cooperatively with suburban mayors, two thirds of them Republicans and Independents, to implement the largest mass-transit plan in state history, adding 119 miles of new rail tracks to the region. As Governor, Hickenlooper also enacted the first methane regulations in the country, following a year long negotiation with the energy industry and environmentalists. Methane is a major contributor to climate change, 30 times more devastating than carbon dioxide. The regulations became the model for California and Canada. The Governor’s ability to bring people together was also demonstrated in his electoral success. Hickenlooper was one of only two Democratic governors to win a swing state in 2014, one of the worst years for Democrats in decades, despite being a top target of the RGA. He left office last month as the most popular governor in decades, in a state evenly divided among Democrats, Independents and Republicans.